Futera is one of those card companies I wish collectors in the United States would pay more attention to. 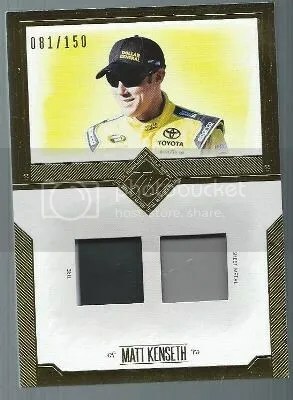 This company makes some awesome looking cards. Here in the U.S., we have new card products coming out all the time. Futera is the total opposite. They produce a handful of high-quality card sets each year. The collector services that Futera offers is incredible. Every time I talk about this company, I have to mention their Code for Collectors and Memorabilia Colour Grading services. Code for Collectors enables you to see the detailed process of how your favorite memorabilia card came to be. 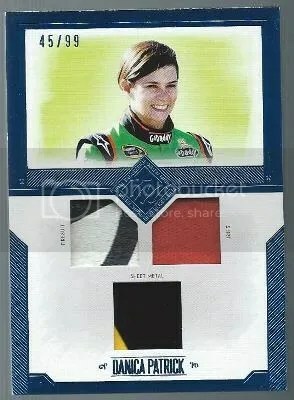 Memorabilia Colour Grading is a service in which you can use to tell how many 1-color, 2-color, 3-color, etc… relic cards were made of a specific card. This is very helpful when it comes to cracking down on fake patches. U.S. collectors would love to have services such as these. Futera is preparing to launch it’s latest round of products. 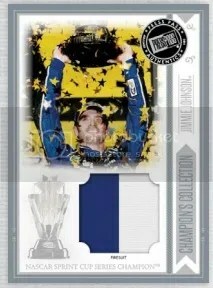 This time its all about a series of Limited Edition Memorabilia Card Presentation Sets. There is a total of (10) quality football (soccer) memorabilia cards in each set, comprising a complete 9-player memorabilia card set plus an ultra-rare centerpiece memorabilia card of one of the featured players. 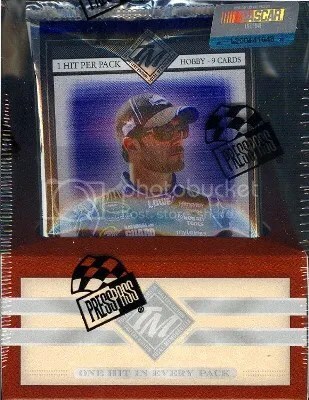 The release features game-used and training-used memorabilia – information about the player’s memorabilia is written on the back of the card. Every card features a 24ct gold-plated element framing the player’s memorabilia. Each card is individually foil numbered and has a unique security code. Enter card codes on the FUTERA APP to digitally sort and store the cards in an online Card Album and get information about the rarity and features of each card and Portfolio/card values based on actual card sales (powered by PriceGuide.cards). These are free information services active shortly after the launch. Manchester City FC (10 sets), Liverpool FC (29 sets for each title), and World Football (27 sets for each title) cover this new product. Each set cost $499. According to Futera, the Liverpool FC sets are completely sold out already. Sets should start shipping near the end of the month. Click on each picture for that set’s sales sheet. 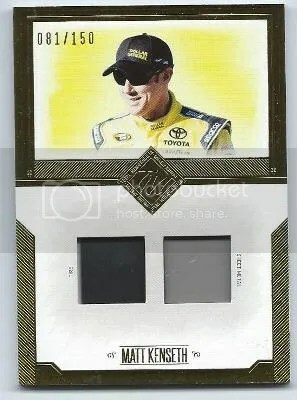 Congrats to Marc on being the lucky winner of the Matt Kenseth 2014 Press Pass Total Memorabilia Tire/Sheet Metal Relic #’ed/150. 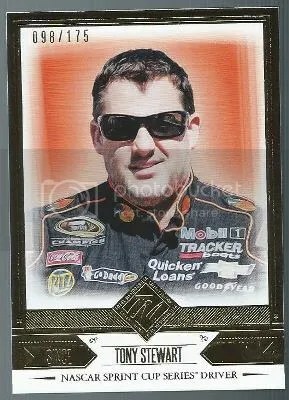 Once Marc sends me their mailing address, I will ship this card ASAP. Thanks! 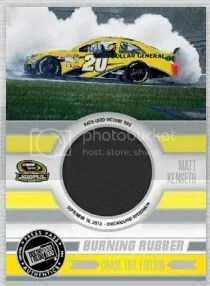 This contest is for a Matt Kenseth 2014 Press Pass Total Memorabilia Tire/Sheet Metal Relic #’ed/150. Good luck!!! This contest will end Friday, April 25, 2014 @ 8:00 p.m. EST. 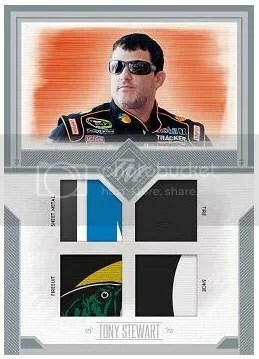 From a design point of view this year’s version of Total Memorabilia looks way better when compared to its predecessors. Lets start with the box itself. Up until this year, Total Memorabilia packs came tightly crammed into a small box. Trying to get that first pack out was a pain. For 2014 Press Pass placed the five foil covered packs in a more traditional clear box. That itself is a major improvement. Now lets get to the cards. They don’t look half bad either. Press Pass used white card stock and a filter to make the photos have that painted feel to them. 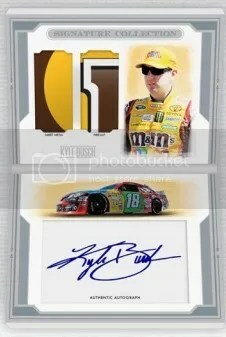 The most disturbing aspect would probably be the 3D mini shadowbox like way they went with the autographs. 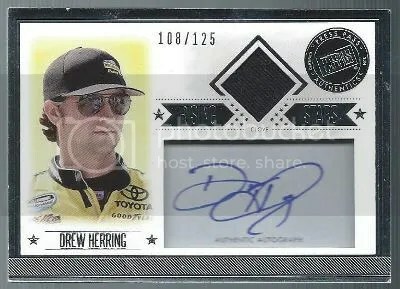 Its a 3D white box that has the autograph sunk in to the bottom of the card. This has been a standard for Press Pass when it comes to this product. 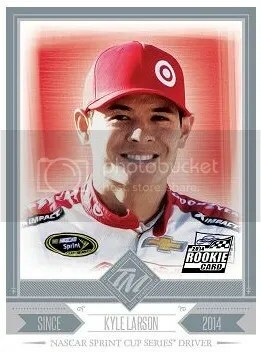 Your attention really gets drawn to that part of the card, and maybe that’s what Press Pass is going for. 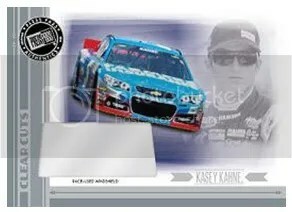 One of the new innovations that Press Pass included this year is race-used windshield cards. We’ve never seen windshield relics before. 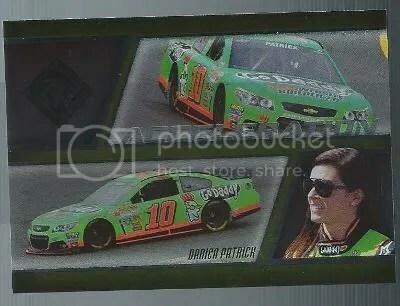 It almost looks like there isn’t anything in the card because the windshield is so clear. 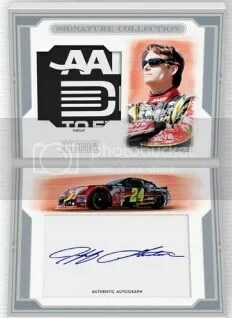 I think Press Pass should have placed a piece of clear windshield over the 3D white box autographs. Boxes are currently selling for $90.00. Its a “hit” driven product. Something for everyone in each pack. 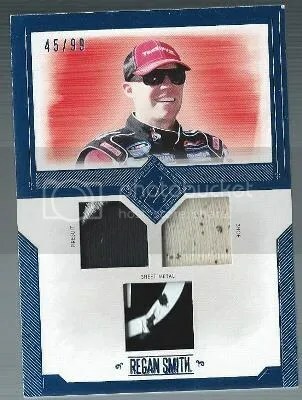 Overall, I give 2014 Press Pass Total Memorabilia Gallery Edition 4 checkered flags out of 5 (1=poor & 5=perfect). Its a step up from the other Total Memorabilia sets, especially from a visual perspective. I still think it could use some tweaking. I’m just glad they changed the design of the box. 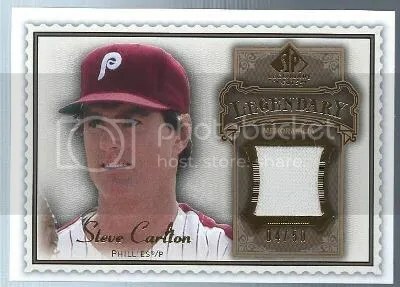 This contest is for a Steve Carlton 2009 Upper Deck SP Legendary Cuts – Legendary Memorabilia Jersey #’ed/50. Good luck!!! This contest will end Friday, January 31, 2014 @ 8:00 p.m. EST. Press Pass seems to have given Total Memorabilia a complete makeover. This is a great thing considering only after two years it was beginning to feel like Triple Threads (prior to it’s redesign). The 2012 set reminds me of Ultimate Collection which I liked. Last year’s set has that terrible pattered grey background that looks like the wallpaper you’d find in an old lady’s house. 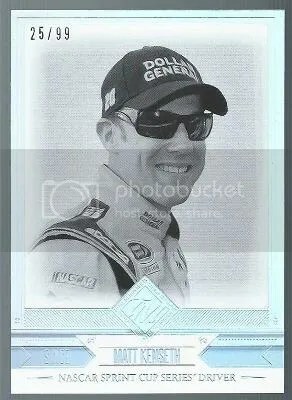 2014 Total Memorabilia not only looks a lot better than it’s predecessors, but contains some new memorabilia that collectors haven’t really seen before. The two new types of cards to look for include Dirt Track Treads and Clear Cuts. 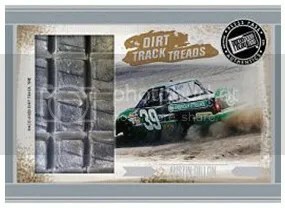 Dirt Track Treads contain pieces of truck tires that were used at the first dirt track race at Eldora Speedway. Clear Cuts (totally unrelated to Strata’s Clear Cuts) will have a piece of race-used windshield in them. 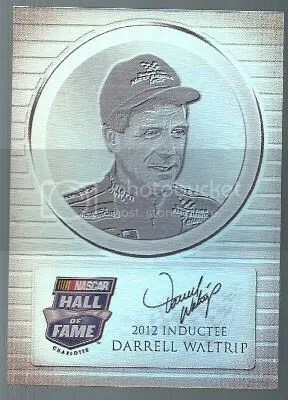 In addition to that, Total Memorabilia will have the standard firesuit, tire, shoe, and sheet-metal relics we’ve all seen before. The only drawback I see are the big white boxes for the autographs. Overall, I would say that this product looks better than their high-end Five Star set they plan to release later this year. 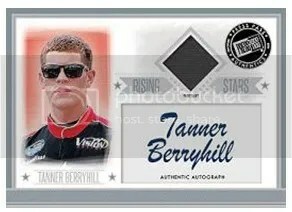 Every box has (5) autographs/relics, (5) NASCAR Hall of Fame Plaque inserts, (5) Acceleration inserts, (5) parallels, and (25) base cards. 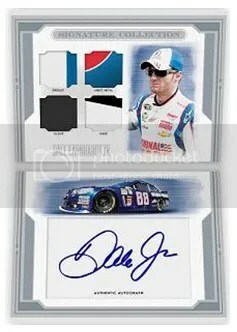 According to Dr. Prices’s blog, it looks like In The Game will bring back its Ultimate Memorabilia SuperBox for the National Sports Collectors Convention that begins later this month. This marks the second year in a row for them to do so. This year’s SuperBox applies to ITG’s Ultimate Memorabilia 12th Edition hockey product. ITG has only made 100 UM-12 SuperBoxes for the National this year. 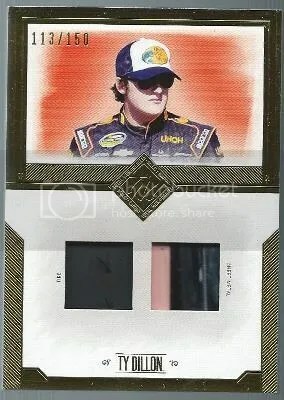 Each UM-12 SuperBox will contain a 1/1 Extra Card inserted into UM-12 boxes and in addition the UM-12 National SuperBoxes can be redeemed at The National for a 1/1 Redemption Card. Extra Card – Each UM-12 Ultimate Memorabilia SuperBox will contain an Enshrined Memorabilia Card made specifically for the 34th National. Every Enshrined Memorabilia Card will contain a relic from a member of the Hockey Hall of Fame. Oh ya! These are all numbered 1/1 too. Redemption – The UM-12 Ultimate Memorabilia SuperBox itself can be redeemed for a special 1/1 Enshrined Dual Game-Used Memorabilia Card featuring two members of the Hockey Hall of Fame. 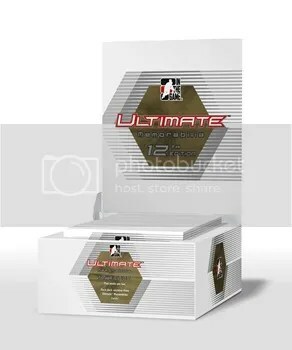 If you’re having trouble finding one of these UM-12 Ultimate Memorabilia National SuperBoxes, shoot ITG an e-mail at: info@itgtradingcards.com and put National SuperBox in the subject line. Arrangements can be made to ship your SuperBox for pick-up in Chicago if you act quickly. 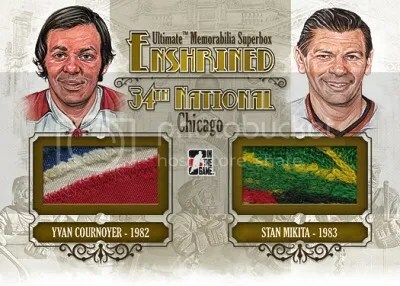 ITG’s Ultimate Memorabilia 12th Edition is a super high-end hockey product that costs around $600.00 per box. Its not for your average hockey collector. Don’t worry, ITG will have more promotional programs that involve their other products which don’t cost quite as much to take part in.